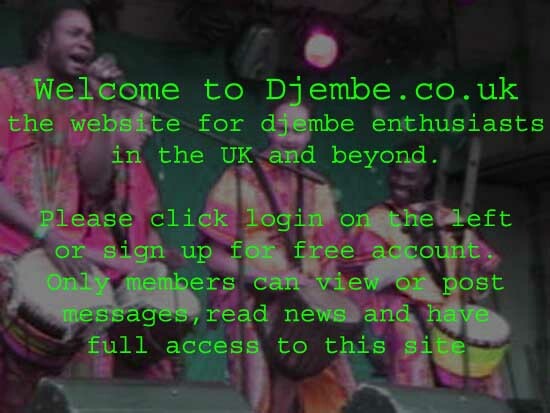 This West African drumming festival is scheduled from Tuesday 25th August until Monday 31st August 2009. It will take place in Camerton, nr Bath in Somerset. We have four days of drumming, singing & dancing workshops with a 'rest day' in the middle (Friday 28th) for cultural activities (such as cooking, drum skinning and chilling out). Teachers include Seckou Keita, Nansady Keita, Modou Diouf, Landing Mane, Ben Lawrence, Idrissa Camara, Diene Sagna, Vieux Bakayoko, Surahata & Binta Susso, Hans Sutton, Mockolo Sawane, Karim M'Baye, Yaw Asumade, Jamie & Simon from Tanante, Malo Sonko. There will be live West African performances each evening with late night curfews and licences until 1am on Friday and Saturday. There is a bar and community hall which will stage the evening performances, and provides all amenities, such as showers, toilets, kitchen etc., and camping is available.